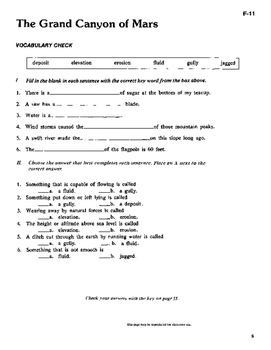 RL 6.0-7.0 This Reading Comprehension and Vocabulary Development PDF eBook with student activities will ignite the interest of your reluctant reader and rekindle the enthusiasm of your accomplished one with these high-interest/low-readability stories. Each book includes 10 original, exciting and informative short stories that cover a broad range of topics such as Tales of Adventure, Science, Biographies, Tales of Fantasy, and Interpersonal Relationships. Multi-cultural and non-sexist guidelines have been observed to provide reading material for a wide population. New vocabulary is defined and used in context. Pronunciation entries are from Thorndike Barnhart's Advanced Dictionary. 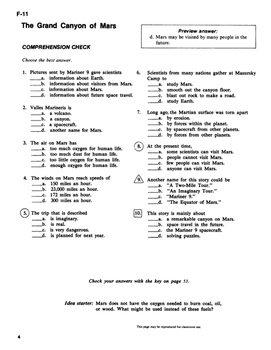 Reading levels were developed and measured by the Fry Readability Scale and written using McGraw-Hill’s controlled vocabulary. Students learn how to preview and survey through a preview question by focusing on key sentences and/or paragraphs designed to teach essential skills. Each lesson illustration is intended to add interest to the story and to assist the reader in understanding the selections, plot, and character development. 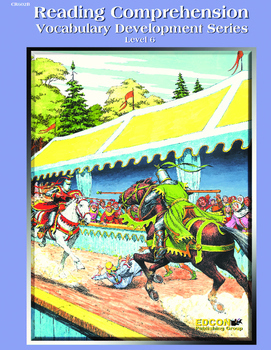 This is one of 27 different titles from among 9 reading levels in this series. EDCON Publishing Group offers teachers hundreds of e-products in digital format to improve basic skills development.